The aftermath of World War II left a number of legacies to the world - a series of minor wars. Although these were considered to be 'little wars' they were still certainly quite big enough and nasty enough to the men who had to fight them. One of the first of these wars was against the Communists in Sth East Asia who had been emboldened by the initial Japanese victories over their colonial 'occupiers' . After the election of Chin Peng to the position of Secretary General of the Malay Communist Party in 1947, the communists strengthened their resolve to defeat the British Colonialists. They had stored in the inhospitable jungles of Malaya a considerable amount of arms and equiment they had captured from the Japanese during the war. So on June 16 1948 the CT's machined-gunned to death three rather influential rubber planters at Sungei Siput in Northern Malaya. Two days later the Malayan Federal Legislature passed Emergency Regulations. The emergency was to last for 12 years and cost 12000 lives. Britain, as leader of the Commonwealth, requested Australian and New Zealand assistance in countering the communist terrorists. So in 1950 Australia sent a Lincoln Heavy Bomber Squadron and a Dakota transport squadron to Tengah in Singapore. In 1955 the Prime Minister of Australia Robert Menzies agreed to increase its military force by committing Navy, Army and further Airforce Units to the Malaysian based Commonwealth Strategic Reserve. The R.A.N's contribution was two destroyers or frigates. On 2nd July Warramunga and Arunta became the first RAN Ships to join the force. Other ships which served during the emergency were HMA Ships Quickmatch, Queenborough, Anzac, Tobruk, Vampire, Vendetta, Voyager, Melbourne and Quadrant. Some of which took part in Bombardments against the CT's in Johore State. The RAAF Lincolns dropped 85% of the total bomb tonnage used in the campaign - five times more than any other squadron. The RAAF left Malaya in July 1958. The Australian Soldiers who arrived in Malaya in 1955 as members of the 2nd Battalion, Royal Australian Regiment stayed in Malaya until the end of the emergeny in 1960. During the last 5 years of the campaign the 1st, 2nd, and 3rd Battalions served as members of the Far East Strategic Reserve. They lost 15 Killed and 27 Wounded in Action. This was to prove a very handy training ground for yet another larger anti-communist guerilla conflict to follow. Vietnam. 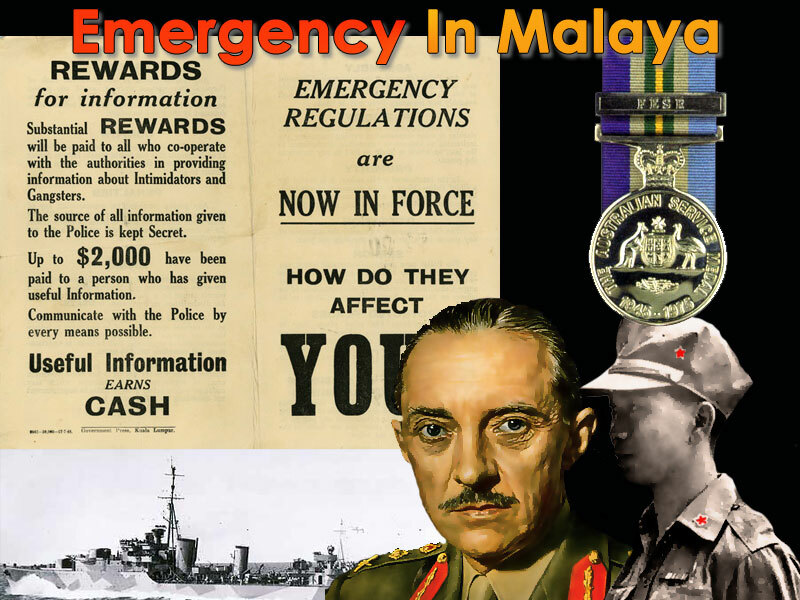 The Malayan 'Emergency' was the British government's official term for the conflict. The Communists called it the Anti-British National Liberation War. The British owners of the rubber plantations and tin mining industries had insisted on the use of the term "emergency" since their losses would not have been covered by Lloyd's insurers if it had been offcially deemed, and called a "war."